As usual I’ve been planning on writing an opus on this crazy election season, but I’ve opted for this little piece on the Democrats to start with. Hopefully I can get to the Republicans soon. 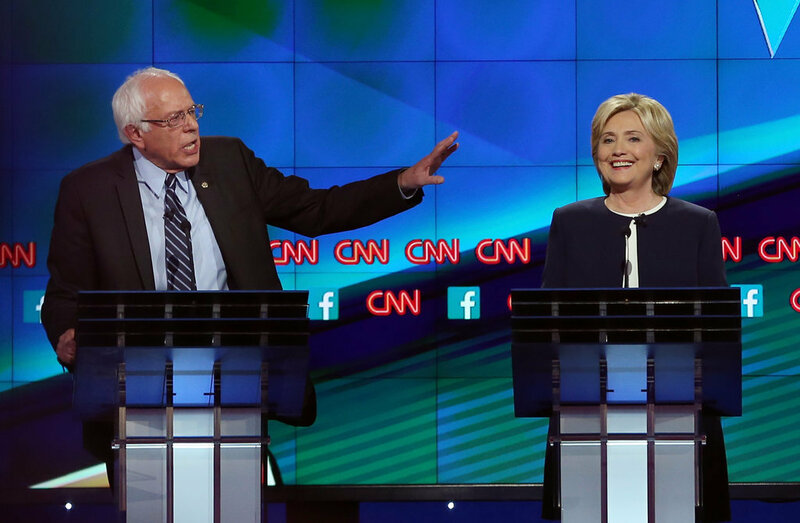 After a virtual tie in Iowa, Hillary got trounced this week in NH and Bernie Mania is in full bloom among Democrats. Bernie Sanders has tapped into some very important issues in this election: a government and a political process that is captured by special interests, growing income inequality and a yearning for honesty in a political (and societal) culture that is sorely lacking it. In some ways his candidacy is a mirror image of Trump’s candidacy, but with very different policy prescriptions. They both tout their independence from special interests, they both are fighting a battle against their party’s traditional structure, and their supporters both believe that they are speaking truth to power and that their policies can help halt the decline of the American Middle Class. Sanders has performed much better than anyone expected, both in fundraising and in actual vote totals, but one thing should be clear: Bernie Sanders 2016 is not Barack Obama 2008. In 2008 Barack Obama campaigned with a real strategy to win the nomination, and detailed policy positions on all issues including foreign policy. Bernie, in my opinion, has not approached this campaign with the seriousness and determination of someone who wants to become the next President of the United States. Instead, he acts like someone who entered the race in order to bring a few key issues to the forefront of our political debate and push Hillary Clinton to the Left during primary season. Of course, Sanders would never admit this, but like a bad gambler, he’s tipped his hand at key times that illustrate his real expectations for this race. In August 2015, Martha Raddatz interviewed Bernie Sanders on This Week and pointed out that “There are two issues that are entirely missing from your campaign website, and those are issues of national security and foreign policy. Don’t you feel these are issues a president should be very concerned about?” she asked. Bernie looked a little sheepish and basically said that he had only been running for three and a half moths and hadn’t gotten around to posting anything about foreign policy, but that they would do that soon. But perhaps the most obvious example of why Bernie is not seriously taking on Hillary Clinton is his refusal to attack Clinton on her State Department e-mail or use it as a broader attack on Clinton’s character. In the first Democratic Debate, when the topic came up, he refused to engage with Hillary, famously saying that America was “sick of hearing about your damn e-mails.” No matter how this was intended, it certainly wasn’t the attack of someone who wants to destroy his political adversary and take her place as the front runner. Even if you think that there’s no merit to the Republican argument that Hillary is facing an imminent Federal indictment for how she set up her e-mail as Secretary of State, the whole episode is a perfect way to go after Hillary on her biggest vulnerability: the fact that majorities of Americans consistently state that they don’t believe she is “honest and trustworthy.” Sure, Bernie has tiptoed around this idea, questioning whether Hillary has been consistently progressive in her career or whether her contributions from Wall Street have influenced her policy, but he has consistently refused to make the arguments that the Republicans will be making every day once she gets the nomination. Bernie Sanders does not expect, and never did expect, to be president. He entered the race as a longshot – a protest candidate who wanted to get his message about income inequality and an economic system “rigged” to favor the rich onto a larger stage. Maybe he could push his party a little further to the left on issues important to him before he was forced out of the race. Despite more success than anyone, including Sanders, expected, he remains a long-shot candidate. He performed well in Iowa and won in a landslide in New Hampshire, but he knows very well that the demographics in those states are the best he will see for the rest of the primary campaign. He could blast Clinton on the trust issue night and day, and probably sway some voters. But it doesn’t seem likely that he would accomplish much more than souring a considerable portion of the Democratic electorate on Clinton and making her more vulnerable to the ultimate Republican candidate. Sure, Bernie Sanders would like to win the primary, but he’s smart enough to know the odds are stacked badly against him. And he also knows that savaging the eventual nominee might have the unintended effect of putting a Republican in the White House. So, he continues to hit her from the left. On Henry Kissinger. On Wall Street. But he refuses to amplify the most effective attack, because he just doesn’t want to do too much damage. Howard Gutman in Politico takes the argument even further. Not only is Bernie Sanders not running a campaign that will deny Clinton the nomination, he may also be the best thing that could have happened to her this election season.”He’s pumped a huge amount of oxygen into a race that could easily have been starved for attention. And even more importantly, he’s made sure that the biggest story in the race isn’t Clinton’s own background.” At least so far, the campaign is serving to sharpen Hillary’s debating skills and highlight the Democratic party positions instead of ceding the airwaves to the Republicans and their increasingly hyperbolic attacks on the Obama administration. This is an echo of a phenomenon we saw in 2008. Obama and Clinton were engaged in a sometimes bitter fight for the Democratic nomination. Clinton had gone from being the odds on favorite to win the election and was now facing a challenge from a freshman Senator with a much thinner resume than herself. Their supporters retreated to their respective corners and the respective surrogates attacked the other campaigns. Millions tuned in to watch their debates and many in the party wondered whether the party could come together in November. To add to the drama, after it was clear that Obama would win the nomination, Hillary started racking up huge wins in large states, mostly with the backing of white rural voters. Much to the Republican’s chagrin, the Democrats united that summer and Obama went on to beat McCain soundly. Bernie has highlighted some of the problems Clinton is going to face in November, but I think she recovers here, and moreover, a little adversity will do her good. In many ways New Hampshire and Iowa were tailor made states for Sanders. As we get into larger and more diverse states, the the terrain gets more favorable to Clinton. That, combined with the fact that most “superdelegates” are supporting Hillary, will allow her to lock it up. This race will stretch for a few more months, but that’s not necessarily a bad thing for Hillary Clinton. The Republican Senate minority blocked the extention of tax cuts for all Americans today in an attempt to make sure that the top 2% get to keep all of their tax cuts. As part of this effort, Senate Republicans even voted against changing the threshold to $1,000,000 a year for the Americans who reaped almost all of the benefits of the past decade. Just to be clear, what that would mean is that the first $1,000,000 (after deductions) that everyone makes would be taxed at the same rate as it was during the Bush years. The 2nd million, would then be subjected to a 4% increase over Bush rates. Not good enough for Republicans. They want to extend Bush tax cuts permanently for not only your first million, but your second million too. How will they pay for that? They won’t. Just add it to the deficit they’ve been complaining about for two years straight. And what about extending unemployment benefits during the worst recession in 90 years? No, that has to be paid for. Here’s what Bernie Sanders thinks of that. Wish the president would give a speech like this. It might help to clarify a few things.